Football is a team game, where every individual needs to do their job for the team to get the necessary six inches. The offensive line must flow as one, and defenders must react in concert. But sometimes an individual talent can transform a team. Joshua Soden makes the case that Todd Gurley can be one such player. One of the most interesting rookies to follow during the 2015-16 season will be Todd Gurley, who is, by all accounts, a transcendent talent that only enters the league every so often. On talent and potential alone, Gurley is at the top of his draft class in terms of what he can become in the NFL. He has everything that teams look for in terms of a franchise running back, combining a rare blend of size and speed that make him as near to a can’t miss prospect at the running back position as Adrian Peterson. The St. Louis Rams selected Gurley in the first round, 10th overall. Although Gurley appears to be the prototypical running back, there was a very realistic chance he could have fallen out of the first round due to injury concerns, which would have continued the drought for first-round running backs that started in 2013. Teams are passing the ball more, and finding that RB is a position where value can be had in the later rounds of the draft, representing a paradigm shift from the aughts, where is wasn’t surprising to see a RB selected in the first five picks of the draft. Of the 13 1,000 yard rushers in 2014, seven of them were drafted in the third round or later. Couple that with the fact that Gurley suffered a season-ending ACL tear, and it becomes understandable why teams may have passed on Gurley despite his tantalizing potential. Most teams expect their first-round selections to be significant contributors right away, and there’s a possibility Gurley may have to open the 2015 season on the PUP list. But, in a case like Gurley’s, teams have to weigh the short term risk vs. the long term benefits of selecting him in the first round. The team willing to gamble on him in the first round may end up selecting a franchise running back and a building block at a discounted rate. A torn ACL, while a significant injury for a running back, is not career threatening. Willis McGahee suffered a far more severe injury in the 2003 national championship game while playing for the Miami Hurricanes, but was still selected in the first round by the Buffalo Bills. He went on to eclipse the 1,000 yard mark three times in his first four seasons, and was a two-time Pro Bowl selection. Peterson tore his ACL and MCL in December of 2011, and bounced back to play 16 games, rush for more than 2,000 yards, and win the NFL Most Valuable Player award in 2012. There is a very realistic chance Gurley can make a full recovery and be the same running back he was before the knee injury. Leading up to the draft, he had his knee re-examined, and all reports have him on or ahead of schedule to make a full recovery. The Rams selecting Gurley in the first round was a move that, on its surface, may not make a ton of sense seeing how they had larger holes to fill along the offensive line and at wide receiver. 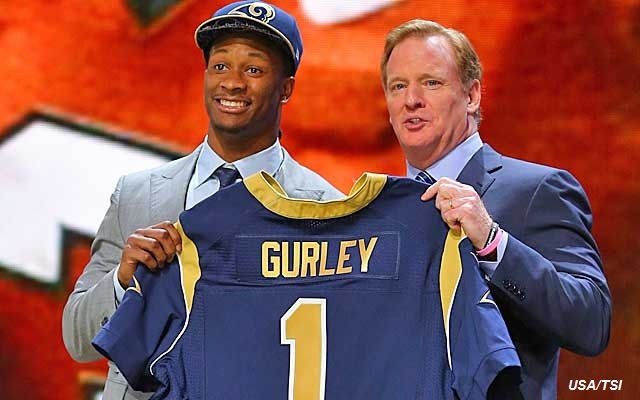 Furthermore, Gurley was the Rams’ fifth RB selected in the last four drafts. He’ll be competing for carries with 2013 third rounder Tre Mason, and 2012 selection Isaiah Pead. The Jets acquired Zac Stacy (2013 5th round pick) in a trade during the 2015 draft and claimed Daryl Richardson (2012 7th round pick) off waivers after he was cut by the Rams in 2014. None of the above mentioned RBs have Gurley’s ceiling. Mason led St. Louis with a -0.9% DVOA last year, good for 21st in the league. Despite the large amount of resources invested at the RB position, the Rams have a couple of pedestrian players. St. Louis’s crowded backfield may seem like an issue, but it’s actually a positive for Gurley. It should allow the Rams to let him heal as long as necessary to ensure that he’s 100 percent when he returns to action. Jeff Fisher is a veteran coach on good terms in St. Louis, so he can afford to wait on Gurley’s production, and likely won’t jeopardize his future by rushing him back too soon. Gurley’s physical running style also complements Mason’s speed and agility well, and the two should pair nicely. Although Gurley may have been more of a luxury pick for the Rams, he has the potential to elevate an offense that finished 25th in DVOA last season to new heights. Even if his season doesn’t begin in Week 1, like Odell Beckham, Jr. last year, he has the ability to transform his team’s offense whenever he arrives. Follow Joshua on Twitter @joshu_wa. Joshua Soden has covered the emerging Jelani Jenkins, the fully recovered Rob Gronkowski, and previews the big games. Joshua Soden is a lifelong New England resident, born and raised in Connecticut. He's an avid Red Sox fan, Dolphins fan, and cat enthusiast. When he's not working as a CNC Programmer in the aerospace industry, he likes to read, hike, sample craft beers, play softball, get hurt while playing softball, and fall asleep on his couch. He's happy to help contribute to Football Central, but is mostly glad that he can finally justify his "sportsball obsession" to his lovely and incredibly patient girlfriend.